SGRE would supply 76 SG 10.0-193-DD turbines to Vattenfall’s Hollandse Kust Zuid I & II project in the Dutch North Sea, if the deal translates to a firm order. Vattenfall was awarded the rights to build and operate the Hollandse Kust Zuid I & II project in March 2018 following a tender. Offshore construction works are already underway and the site is due online in 2022. As part of the deal, SGRE would also supply Vattenfall with its 10MW turbine for the Hollandse Kust Zuid III & IV project should Vattenfall be successful in the on-going tender for the site. The Dutch government offered the second site in another subsidy-free tender, the result of which is expected in June. Vattenfall bid in to the tender, as did Danish developer Ørsted and a Shell-backed consortium. All four Hollandse Kust Zuid sites were initially offered as 350MW. However, they will all single dynamic subsea cables capable of being temporarily subjected to a load of up to 380MW, transmission system operator Tennet explained, enabling 152 10MW turbines to be used in total, rather than 140. SGRE unveiled its 10MW turbine in January, following similar product launches by rivals manufacturers. The turbine has a 193-metre diameter rotor, 94-metre long blades and will be capable of annual energy production up to 30% greater than that of its 8MW predecessor, the manufacturer claimed. A prototype will be installed later this year. 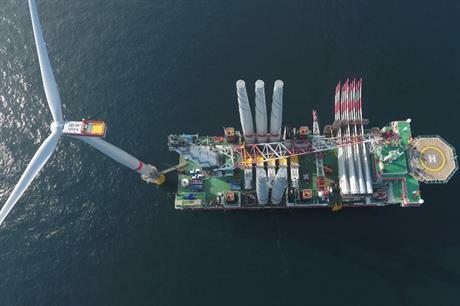 SGRE and Vattenfall have previously collaborated on several wind farms, including the 288MW DanTysk and 288MW Sandbank projects in the German North Sea, the 110MW Lillgrund site in Swedish waters, and the 600MW Kriegers Flak project being built off the coast of Denmark.